In a recent CCV article, we looked at seven powerful trends in the vending industry. The opening paragraph focuses on cashless payments, and we also explore the use of smartphone payments in the vending industry; also known as the “mobile wallet”. In this article, we will look in more depth at the rise of cashless payments, and what this means for the vending industry. We’ve split this into three areas: card payments, mobile payments, and connected digital accounts. Consumer behaviours are changing more rapidly than ever before. The ECB says the number of EU non-cash payments jumped by 7.9% to 134 billion from 2016 to 2017. A cashless society is a real possibility in the near future – for some countries at least. As less people use cash in their everyday life, the cash-based infrastructure becomes less affordable to maintain. This has a snowball effect, resulting in a wider switch to digital transactions. The prospect of a cashless society is controversial. It has strong critics, citing concerns about security, bank dominance, and reduced independence. There is also a danger of marginalising people who rely on cash – those without bank accounts or access to digital technology. These are the recognised risks of a cashless society, and they are worthy of consideration. But they’re not unsolvable problems. In the UK, charities are already creating solutions for homeless people to accept card donations. Whilst the bigger aim is of course to eliminate homelessness, these initiatives ensure that vulnerable people aren’t left behind by less cash in circulation. Sweden is perhaps the closest to becoming a cashless country, with notes and coins representing just 1% of the economy. Among citizens who are 18-24 years of age, 95% of purchases are made using a card or smartphone. Most amazingly, it’s estimated that half of Sweden’s retailers will stop accepting cash completely by 2025. Each country has a different cultural relationship with cash, and this impacts likelihood and/or speed of switching to cashless payment solutions. With the background to cashless payment growth in mind, it’s no surprise that the vending industry is a major player in this sphere. From the customer perspective, it’s inconvenient for a vending machine to only take coins, and from the vendor’s perspective it can be complex and costly to use cash. Paresh Patel picks apart the hidden costs of accepting and processing cash in his excellent and detailed piece for Vending Market Watch. This is worthy reading for any vendor weighing up the pros and cons. We automatically think of chip-and-pin, or contactless credit and debit cards. Indeed, this is the main form of cashless payments on offer at vending machines – but customers are demanding varied forms of payment through their smartphone. Let’s take a look at these various options, and what they mean for the vending industry. According to research by the Bank for International Settlements, card payments are booming but this doesn’t mean the end of cash. Citing massive geographical variations, it seems that “cashlessness” isn’t a straightforward trend: cash circulation depends very much on the country. However, there is an indisputable increase in card payment terminals, doubling in density for advanced economies between 2007 and 2016. The average value of a card transaction has dropped, indicating better infrastructure and openness to paying by card for smaller items. Whilst the prospect of a cashless society isn’t clear for every country around the world, it is true that card payments are on the increase. The vending industry has adapted quickly, with a huge drive to replace (or update) coin-based machines, and to integrate contactless terminals into the design of all new vending machines on the market. Whilst chip-and-pin is widely used, it’s contactless card payments that will continue to drive this trend forward. In 2018, Mastercard reported that almost 50% of all card payments in Europe are contactless, and predicted that by 2020 all point-of-sale terminals will allow contactless. Of course, the vending industry is not watching idly on the sidelines. Mobile payments are on the increase, and this has a huge impact for the vending industry. Research shows that more than 87 million people use Apple Pay around the world, with rival Samsung boasting about 34 million users. These systems lead the way in the west, but China is on another level. Mobile payments have skyrocketed, with 47% of all smartphone owners using their mobile wallet. WeChat Pay alone has 600 million users, and its competitor Alipay currently has around 400 million users. In other countries, habits have been more difficult to shift. In Europe and the USA, the trend is impressive but nowhere near the viral growth experienced in China. In South Korea, one in four people are said to use mobile wallets, with a clear preference among the young and wealthy. India is set to be the next mobile payments stronghold, although connectivity is a challenge. So, with mobile payments gaining popularity worldwide, what does this mean for vending? Quite simply… vendors must cater for mobile payments. As the smartphone market continues to push NFC technology, more people will have this option available to them on a daily basis. Industry commentators have also encouraged vendors to improve awareness by clearly advertising mobile payment capability on their machines. Connected digital accounts can be considered “closed” systems. These are most relevant to a school or workplace, where the customer base is regular, consistent, and captive. Simply explained, a customer will have an account which is topped-up from a central terminal, or through an online transaction portal. Payment can be made at the vending machine using a dedicated smart card or through a smartphone app. The cost of the purchased product is then deducted from the balance in the customer’s account. This system is common at busy temporary events such as festivals, sports events, and concerts – where organisers want to centralise payments and avoid handling vast quantities of cash. It can also be applied to other locations, but the key part here is the captive audience. There are doubts about how effective this approach can be for a non-captive audience. With the rise of contactless cards and mobile wallets that are linked to bank accounts, what would be the motivation to download an app and top-up credit to buy products from a vending machine? This would need to be highly incentivised with discounts and/or loyalty rewards. Even then, it compares badly to the convenience and flexibility of other cashless payment methods. 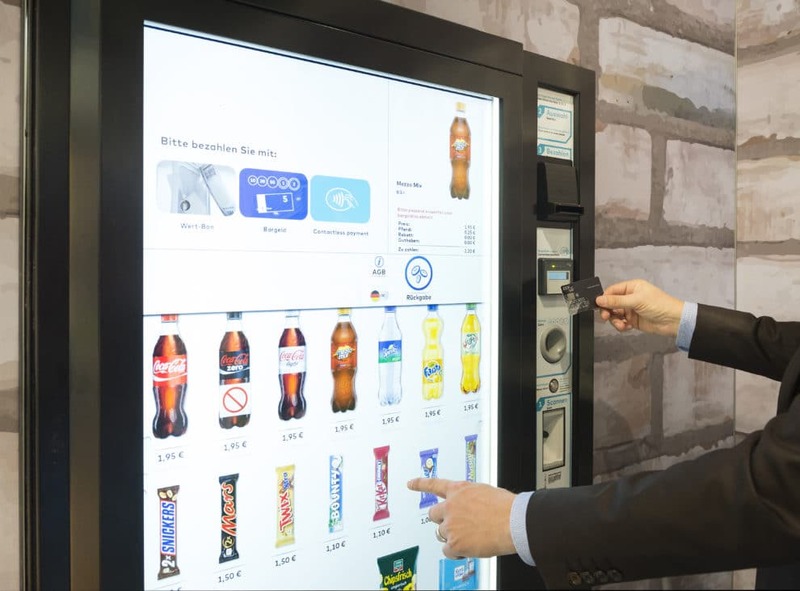 The vending industry is adopting smart technology, and this has revolutionised the public’s view of a typical vending machine. The introduction of cashless machines started some time ago with the integration of chip-and-pin pads, but there is still a lot of room for innovation. Cashless payments are fundamental, as a basic foundation for modern convenience. Whether or not a society is tipped to become totally cashless in the near future, it’s certain that contactless card and mobile payments are increasing. This is an opportunity for the vending industry to boost sales, increase individual sale value, and improve operational efficiency.